A text by Claire Savoie about the installation Les attracteurs étranges figures in the Spring / Summer 2009 edition of esse arts + opinions magazine. Themed section on various forms of disappearance of the part of the artwork—from imperceptible trace to visual disruption, from dissimulation from view to total absence. Including 3 portfolios. Articles: Work by Shu Yong, an interview with Daniel Buren, Duchamp and Music, a portrait of curator Nicole Gingras, Claudia del Fierro at Optica gallery, Intrus / Intruders exhibition at the MNBAQ. A text by Claire Savoie about the installation Les attracteurs étranges is featured in the Spring / Summer 2009 edition of esse arts + opinions magazine. 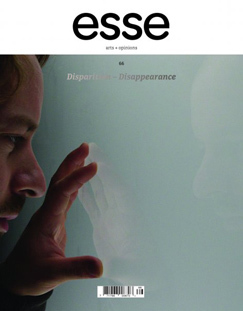 n° 66 – Disparition | DisappearanceThemed section on various forms of disappearance of the part of the artwork—from imperceptible trace to visual disruption, from dissimulation from view to total absence. Including 3 portfolios.Articles: Work by Shu Yong, an interview with Daniel Buren, Duchamp and Music, a portrait of curator Nicole Gingras, Claudia del Fierro at Optica gallery, Intrus / Intruders exhibition at the MNBAQ.